Since 1996 Hiltron has been manufacturing control units for SatCom equipment and for industrial control & monitoring applications. One of the main products is the Controller HCS3 with its unique features. The existing design has been upgraded to a new controller generation ComSys-Core with additional new features. The new generation combines all the previously available systems in a base system ComSys-Core. Depending on the different applications a variety of modules are available to be integrated into a functional unit. There are two types of chassis available, the 19”/2U equipped with up to 16 modules (16 slots) and a small chassis equipped with up to 8 modules (8 slots) suitable for cabinet installation. 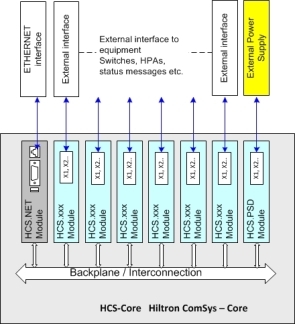 HCS.NET – Module for network communication, LAN interface, controller. 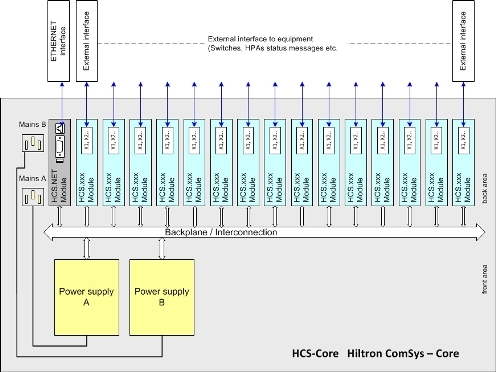 HCS.SSI – Module for antenna control with interface for 17 bit optical SSI encoders. HCS.RES – Module for antenna control with interface for resolver transducer. HCS.DCD – Module for control of electronic motors and monitoring with resistive sensors. HCS.DCU – Module for antenna heating control. HCS.PSD – Module for DC power supply, e.g. used in chassis with 8 slot. HCS.PSA – Power Supply for 19”/2U chassis. of HPAs, SSPA and other equipment (e.g. up-converter). HCS.SWI – Module for monitoring and control of WG- and coax-switches. HPA.LST – Module with integrated L-band transfer switches. HCS-10M – GPS synchronized low phase noise 10 MHz reference source. HCS-LNB – dual LNB supply/bias-T with level dection and voltrage/current monitoring. Optional 10MHz reference can be impolemented. Application: Monitoring & Control of switches, LNBs, HPA, Antenna Control units, Antenna Heating systems etc. Interfacing card modules: HCS.NET, HCS.SSI, HCS.RES, HCS.DCD, HCS.DCU, HCS.PSD, HCS.PSA, etc. 19”/2U chassis with redundant power supply, or small chassis option with external 24V power supply. Any new or replacement module recognizes which slot it is located in and registers itself under this address. All modules are hot pluggable and can be exchanged easily during operation. Each module possesses independent functionality. The communication between the modules is maintained even when there is no network module in place. Web based user-friendly operator interface (Web Interface HTTP). Control via SNMP for M&C. Controller for N:1 redundancy HPA switching. Monitoring and control of SSPAs, switches. Controller for N:1 redundancy switching of up-converters. Monitoring and power supply for LNBs. Control of redundancy systems for DVB MPEG encoders/modulators/ IRDs and other applications. Monitoring and control of antennas. Monitoring and control of antenna heating.